Help the FOIA Project identify the worst violations of the Freedom of Information Act by casting your vote for a case of withholding worthy of this dishonor. In honor of Sunshine Week, the FOIA Project invited six prominent experts—Charlie Savage of The New York Times, Jason Leopold of VICE News, Anne Weismann of Citizens for Responsibility and Ethics in Washington, David Sobel of the Electronic Frontier Foundation, Nate Jones of the National Security Archive and Chris Farrell of Justice Watch—to nominate a FOIA case they feel represents a particularly egregious example of improper withholding. They nominated cases in which government agencies either ignored or declined requests for documents on some of the most interesting and controversial topics of our time: the use of drones by the FBI in domestic surveillance, the Obama Administration’s targeted killing of American citizens abroad, the Edward Snowden leaks and others. Which would you vote for? Check out all the case summaries and vote at http://foiaproject.org. The voting opens today, on the eve of National FOI Day, and ends on the last day of Sunshine Week, Friday, March 20, when the FOIA Project will announce the “winner.” Follow the project on Twitter at #foiafail and #sunshineweek. 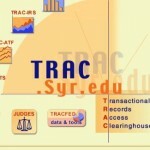 The FOIA Project is administered by the Transactional Records Access Clearinghouse (TRAC), a joint research center of the Newhouse School of Public Communications and the Martin J. Whitman School of Management. The project gives the public free access to information about every case in which government has been sued under the FOIA since Oct. 1, 1997—more than 27,000 documents from 8,600 district and appellate court cases. It’s updated daily, and searchable by plaintiff, defendant, location and date of suit, as well as other factors.